← Should I Spend Donuts on the Holo-Flag? Should I Spend Donuts on Waverly Hills Elementary? Well right in the middle of the Terwilliger Event we get…another Event! Well, an episode tie-in for this Sunday’s Season Finale episode of The Simspsons, Mathlete’s Feat. And with this little weekend event arrives a couple of new episode inspired premium decorations…including one fancy new elementary school for Springfield! Now I know you may be trying to decide if this is worth YOUR donuts, but don’t sweat it! We’re here to tell you what’s worth the donuts and what you might want to hold off on. 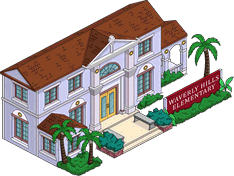 Wondering if you should add Waverly Hills Elementary to YOUR Springfield? 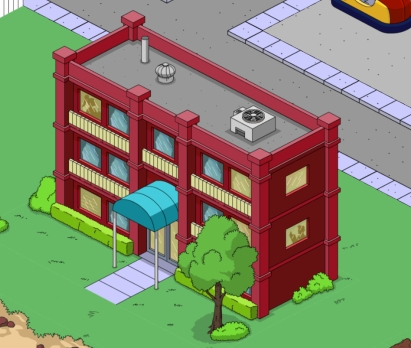 Well before you hit that confirm button let’s break down the pros and cons of adding this fancy school to YOUR Springfield! -Questline is only 2 parts, very short. Save your donuts and don’t even consider this one freemium players! It’s just not worth the donuts for what you get with it. This is a complete premium pass! Of course in the end it’s your decision, we can only tell you what we would/wouldn’t do…and I can tell you, I’m fully passing on this one…it’s just way overpriced. Had it come with a character or been around 50-70 donuts I might consider it. But for 115 donuts, it’s just not worth it. However, whatever you decide just remember that this school will be leaving our stores soon, so if you’re thinking about it getting it make sure you make your final decisions before May 19th or you’ll miss your chance. Skinner: A new elementary school in town? I didn’t think we had enough children to warrant another facility. Last I checked we only had thirteen. Fourteen if you count Uter. Cletus: Schooling ain’t just for the youngins. Now that some kids moved over to that there new school, there’s more room for Spucklers at your learnin’ shack. Teacher says I’m calcalatin my ciphers goodly but my grammarfication needs more work. What are your thoughts on Waverly Hills? Will you be spending the donuts to bring it to your Springfield (or did you already)? Where have you placed it in your Springfield? Sound off in the comments below, you know we love hearing from you! This entry was posted in Buildings, Donuts, Episode Tie-In, Should I Buy, Tips and Tricks, Updates and tagged How do I get Waverly Hills Elementary, Mathlete Feat, Should I Buy Waverly Hills Elementary, Tapped Out Tips and Tricks, The Simpsons Tapped Out, TSTO Addicts, TSTO Mathlete Episode Tie-in, TSTO Tips and Tricks, Waverly Hills Elementary. Bookmark the permalink. Waverly Hills Elementary School – this is the upteenth school campus that long time Tappers are being forced to purchase as a Premium Building (and I’m not happy with EA’s decison to ask us to spend Donuts on a Building that does not come to a new Character, or enough Tasks). Who’s forcing you? I don’t feel forced at all….I just say, “no, thank you” and move on…. I like the look of the building so I added it to my town. I would have liked a longer quest line but then again EA will probably add to this building after the current event is over. Was there ever a SISD done on Rolling Rock or Captain Bob? I’ve been watching for them, but I may have missed them. Waverly and holo flag came out afterwards, and they both have SISDs already, so maybe I (and the search feature) just missed them. They should be up today…unless EA decides to throw us another update. That’s OK. I just thought that maybe I’d missed it. We appreciate all of your hard work, and that there are only so many hours in the day. Thanks Alissa, you’re the best! Isn’t it about time we got a character in an episode tie-in again? what was the last one? Kumiko? I think so…unless you count NPCs. Matt Groening came during Simpsorama… it’s pretty rare considering only two original characters have ever been offered. We usually get decorations, skins or NPCs. Has Kumiko been reintroduced, either as a premium PC or not? I started the game literally a day after she had expired–the tie-in offer, that is. I found out when adding friends about the Japanese PC and was told I should have ‘won’ her in the previous weekend. Nope. She was just released that one time during the episode tie-in. Yup was just gonna say…nope I lied. Matt Groening. Forgot about him. Wasn’t Fat Tony originally introduced during an episode tie-in… it was before I started playing, though. How long is Skinner’s task? Looks nice but it’s not one I must have, with Skinner’s Stonecutter skin I already have some premium tasks for him so that’s not an incentive. Think I’m finally going to buy Krustylu Studios and the Lovejoy Residence, the limited time items haven’t been exciting me lately. It is a nice looking building but with the ridiculous amount of crafting currency it takes to craft the Act 3 items you are going to have to spend donuts to craft everything, there is no way around it. EA forced our hands on this one. Not happy with this event and looking forward to it being over. If EA releases another event with unatanable goals (without paying to achieve them) I’m quiting this game. It will be a shame because I really enjoy it and I have spent A LOT of money already on it. I am looking at it like I can choose what I want to craft most. I got the farmers market and the sani-john. If I’m lucky, I’ll get the houseboat before it’s over. I’m not spending donuts on the stuff I can’t craft. Lots of things go into storage after an event is over anyway. So just have fun and enjoy the game! It is expensive, but it’s beautiful! I haven’t spent very many of the donuts that I’ve been hoarding for this event, so I splurged. It does look like a beach house, eventually (when I can afford beach-front property) I’ll put mine there and hide the sign so it looks like another mansion. If it came with a character or was >80D I might have bought it. As-is, it’s a pass for me. It’s too bad, I really like the look of it. Derp… Got my alligator facing the wrong way… That should read <80D (as in if it cost *less than* 80 donuts). Wow this show is dead without Harry. It indeed is a pretty building, and would great place along the shore, next to the Beach House. I, however, didn’t get the beach house (didn’t need it, even though I had collected enough doughnuts for it). So this premium item, like the one just mentioned will be passed and very likely not missed by me. Do you have a house farm? If so, I suggest getting rid of it – you could free up a sizeable chunk of land and, since you’re at Level 52 with over $169M, I can’t see any earthly need for one. If you don’t have a house farm, then maybe you could consider just rotating what you have on display. For example, you could have a “holiday area” and just show one holiday’s worth of items at a time. My house farms are long gone. Just not into storage. I figure if I can give EA actual cash to buy every tractor and whale they throw at me, they can at least give me land to use it. Granted about 1/6 of my town is dedicated to a “central park” and other such designs but that’s my favorite part of the game next to collecting. It’s also got one of those very subtle nothing-to-write-Gramma-home-about animations, like the YMCA building. Mine couldn’t fit on the beach, so it’s a few blocks from it. Trying to decide if either Barney, with the Plow King costume, or Disco Stu, with the Stonecutter costume, are worth the doughnuts. That’s a tough one. Both cool stuff. I think for my, I like Barney better as a Character. I picked it up right away, as it goes perfectly next to Springfield Elementary, Springfield High School and Springfield Preparatory School that I have all in one common area. Definitely wish it came with a character though, as you mentioned. Alaska Nebraska would have been a great companion to the school!